Thomas and Elizabeth were sent off with a prayer by the community of Holy Trinity in St. Augustine, FL. Last week we were glad to receive Thomas and Elizabeth Manuel at the OCMC, as they went through their final pre-field training before starting their missionary service in Guatemala. The past year was very busy for the two of them. After completing their new candidate orientation, they spent a full year traveling to different parishes, sharing their story, and building up a network of support for their future mission. This is a vital part of every missionary’s journey, as it provides them with both financial support and, more importantly, prayers. The missionary calling of Christ’s Great Commission (Matthew 28:18-20) is for all of us - not only a select group. Physically going out and teaching or building isn’t the only way to respond to the call. We can also support missionaries like Thomas and Elizabeth. Through this support we actively participate in mission work by being part of a group that makes their ministry possible. 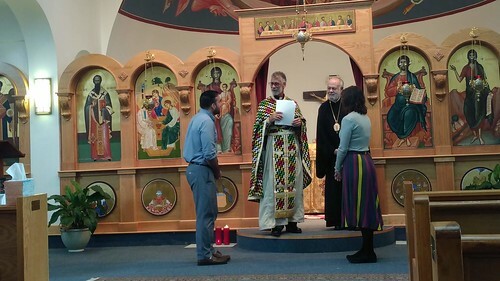 This was perfectly exemplified by their commissioning at their home parish of Annunciation in Norfolk, VA, and again at Holy Trinity in St. Augustine, FL, just prior to their departure. In both churches, the communities came together to pray for Thomas and Elizabeth and send them out to labor in Christ’s vineyard. Following their pre-field training and final commissioning, they departed early on Monday, January 21. Their first stop is in Mexico, where they will spend the next few months studying in an intensive Spanish language program. Once they are fluent, they will begin their work ministering to some of the many Mayan communities around Guatemala and Mexico that have come to Orthodoxy in recent years.